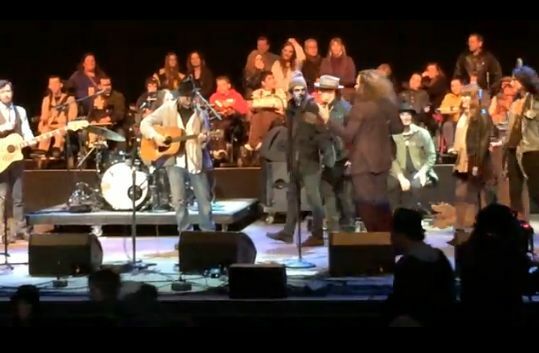 Musicians at the Bridge School Benefit Concert pay tribute to the late Lou Reed on Sunday, Oct. 27, on the second night of the two-day event at the Shoreline Amphitheatre in Mountainview, Calif.
Neil Young, Elvis Costello, My Morning Jacket, Jenny Lewis & others performing “Oh! Sweet Nuthin’” in tribute to the legendary Reed, who passed away at the age of 71. Changes (Phil Ochs cover), Blowin’ In The Wind (Bob Dylan cover), Comes A Time, War Of Man (guests w/ Heart Rockin’ full band version), Harvest Moon (guests w/My Morning Jacket), Oh! Sweet Nuthin’ (guests w/My Morning Jacket – Velvet Underground cover) , Just A Song Before I Go, Human Highway, Don’t Want Lies, Singer Without A Song, What Are Their Names, Déjà Vu, Long May You Run, Suite: Judy Blue Eyes, Teach Your Children. Thanks to Tom H. at Sugar Mountain.